Minimal change as no OVC games played by teams since last NET rating. Changes reflect results of other league games. This is our first ranking below 40 since mid-December. I believe 38 was the lowest. Best MVC team ranking is 110. IMO, we need to be 36 or better to lock in an at-large. The committee will have some 'splainin' to do if a team with a NET of 36 or better doesn't get in. Does running the table in conference play put us sufficiently below 36 to mathematically survive a conference tourney upset? Impossible to answer without knowing efficiency, scoring margins, opponents’ winning % and opponents’ opponents’ winning %, especially without a crystal ball. And remember, NET is just a "tool the selection committee will use to pick at large teams", meaning it will probably be used to justify big $$$ schools getting in and used to exclude worthy other teams. It allows you to look at many different rankings. Pretty cool. I would think that a loss in the championship game would kill our net ranking, dropping us well below a 36. They are supposed to reward winning, winning on the road, and winning against quadrants. That last one is the one that will get us if anything does. It will be interesting to see how things shake out by the end of the season regarding the net ratings. I could be dead wrong, but Ja could single handedly present us with a unique situation. Potential top 5 lottery pick, ton of hype and a legit National POY candidate. The NCAA wants viewers, and if Ja keeps going on this trajectory a LOT of people are going to want to tune in to watch him. Hate to single out the player over the team when we are a lot more than just Ja, but that’s the way it is. I think with even a couple more losses the Ja factor will give us a strong chance with the committee. You want to keep out a 27-4 team with the biggest hype outside of Durham? But hey, one game at a time. As much as I'd love to agree with this, the truth is if we don't win the OVC tourney then it's the NIT at best. We just do not have the resume. A win over Alabama or Auburn may have been helpful but I'm not sure about that because both of those teams have faded. There is no reason we should even be considered an at large, none. Belmont and Murray 64 and 65 respectively after last night. Murray St at 60 would be 5th in the AAC, 2nd in the A10, 1st in CUSA (20 spots ahead of their leader), 1st in Sun Belt, 2nd in the MAC, and 2nd in the PAC12. 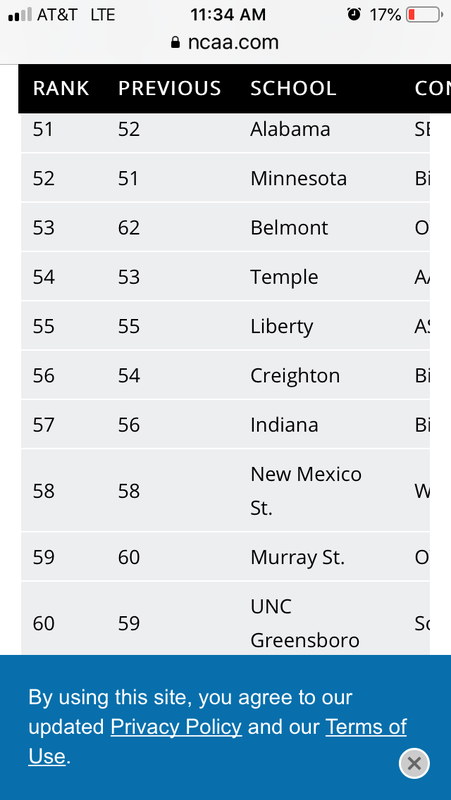 Belmont jumps ahead 9 spots from thumping EIU by 40 last night. You’ve got to thump folks I guess.